WARNING: KPO is best viewed at 1024x768 or higher screen resolution. Looking for that extra edge? Tap into the unsurpassed internet audience! 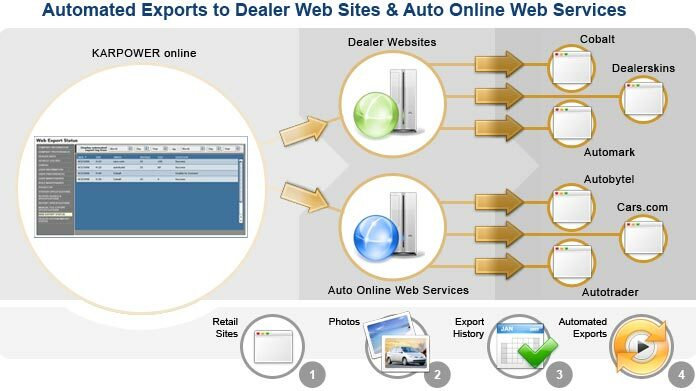 KARPOWER Online's® Retail Web Exports allows you to market your vehicles to millions of internet shoppers. Ensure your vehicle listings are consistent and up to date by managing your online marketing effort with the help of KARPOWER Online and Kelley Blue Book. Then, simplify your workflow by letting us handle the daily export process to your choice of retail Web destinations. Activation is easy. Simply call a Customer Care representatives at 1(949)770.7704 or 1(800)BlueBook to set-up your account. Our research indicates vehicles that include actual photos experienced significantly decreased turn time and improved closing rate – ultimately improving your bottom line. KARPOWER Online gives you the ability to upload, store and manage up to 32 photos per vehicle. Arrange photos in your desired sequence using KARPOWER Online’s sort functionality. Then export those photos to the retail Web site(s) of your choice. Concerned about your inventory being successfully transmitted for placement on the Web? Take the guessing game out of the equation. KARPOWER Online’s Export Status allows you to conveniently monitor all your scheduled exports from a summary page. Looking for a specific export? No problem. Filter the export log by month, day and year. KARPOWER Online streamlines your work flow with its Automated Exports. Automate the generation and transfer of inventory files and focus your time on selling cars. The Kelley Blue Book Operations staff works 24/7 to ensure that our processes complete on-time, every time. We make sure that your inventory is current and available to your potential customers.